BOGO!! 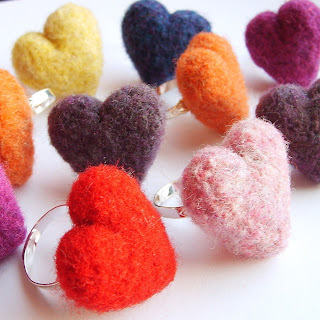 Buy one felted heart ring, get one FREE! From now through Christmas, I will be running weekly specials in my Etsy shop. To kick off the craziness, I'm having a BOGO special on felted heart rings this week. Buy one ring and get one FREE - yep, totally free! There's just one catch - you must put the promo code "BOGORING" in the message to seller at checkout. Please also specify what colors you'd like for each of the two rings. (If it is a specified color heart ring listing, you need only put the free ring color choice.) You can choose from 15 different colors to customize the handmade felted heart ring just for you! And, there's no limit on how many you can purchase either! This special ends on Saturday, November 7th, so hurry into my shop for this great deal! My little felted heart rings are a favorite among my customers. They would make excellent stocking stuffers for the holidays or just a sweet present for yourself and a friend. Please feel free to contact me if you have any questions or comments. CLICK HERE to go directly to the "Hearts" section of my Etsy shop where there are several felted heart rings listed. Wow nice pieces! I like it! Great work.